WHAT IS THE DEEPEST FACT OF LIFE? The deepest surest face of life is that GOD IS RIGHTEOUS. Our only question is what attitude toward that fact we ought to take. HOW DO WE APPROACH THIS FACT? We shall not approach that fact with our "critical reason." "Reason" sees the small and the larger, but not the large. It sees the preliminary but not the final, the derived but not the original, the complex, but not the simple. It sees what is human but not what is divine. WHAT HAPPENS WHEN WE RECOGNIZE THIS WILL? There is above this warped and weakened will of yours and mine, above this absurd and senseless will of the world, another which is straight and pure, and which, when it prevails, must have other, wholly other issues than these we see today. Out of this will, when it is recognized, ANOTHER LIFE MUST GROW. Out of this will, when it emerges, A NEW WORLD WILL RISE. Our home is where this will prevails; we have wandered away, but we can return. There is a will of God which is righteous. If only we might stand in the shining presence of this will, not doubtfully, but with assurance! If only instead of merely guessing at it as men who can only hope and wish in in it, we might contemplate it quietly and take enjoyment in it! If only we might approach it, come to know it and HAVE IT FOR OUR OWN! The deepest longing is born of the deepest need: "Oh that You would rend the heavens, that You would come down!" WHY DO WE RESIST THIS WILL? Pride. We are inwardly resentful that the righteousness we pant after is God's and can only come to us from God. We come to our own rescue and build ourselves a tower of Babel. We are (also) apprehensive of the righteousness of God because we feel much too small and too human for anything different and new to begin in us and among us. This is our despair. ...because we are so PROUD and DESPAIRING we build a tower of Babel. The righteousness of God which we have looked upon and our hands have handled, changes under our awkward touch into all kinds of human righteousness. WHAT DOES HUMAN "RIGHTEOUSNESS" LOOK LIKE? There seem to be no surer means of rescuing us from the alarm cry of conscience than religion and Christianity. Religion gives us the chance, beside and above the vexations of business, politics, private and social life, to celebrate solemn hours of devotion--to take flight to Christianity as to an eternally green island in the gray sea of the everyday. There comes over us a wonderful sense of safety and security...It is a wonderful illusion, if we can comfort ourselves with it...in the midst of capitalism, the housing problem, prostitution, alcoholism...the church's preaching, the church's morality and the "religious life" go their uninterrupted way...WHAT IS THE USE of all the preaching, baptizing, confirming, bell ringing, organ playing, all the religious moods and modes...the efforts to enliven church singing and the unspeakably tame and stupid monthly church papers and whatever else may belong to the equipment of modern ecclessiasticism (religion)? WILL SOMETHING DIFFERENT COME FROM ALL THIS IN OUR RELATION TO THE RIGHTEOUSNESS OF GOD?? ARE WE EVEN EXPECTING SOMETHING DIFFERENT FROM IT? ARE WE HOPING THAT SOMETHING MAY HAPPEN? Are we not rather hoping by our very activity to conceal in the most subtle way the fact that the critical event (submitting to God's will) has not yet been done and probably never will? Are we not, with our religious righteousness, acting "as if" in order to NOT HAVE TO DEAL WITH REALITY? IS NOT OUR RELIGIOUS RIGHTEOUSNESS A PRODUCT OF OUR PRIDE AND DESPAIR, a Tower of Babel, at which the devil laughs more loudly than at all the others? WHAT HAPPENS WHEN WE BUILD A TOWER OF BABEL? It is high time for us to confess freely and gladly: this god, to whom we have built the Tower of Babel is not God. He is an idol. He is dead. We have not begun to listen quietly to what the conscience asks when it reminds us, in our need and anxiety, of the righteousness of God. We have been much to eager to do something ourselves. Much too quickly we have made ourselves comfortable in temporary structures. WE HAVE MISTAKEN OUR TENT FOR OUR HOME...We have prayed, "Thy will be done!" and meant by it, "Thy will be done, but not just now!" We have believed in eternal life, but what we took to be eternal life and satisfied ourselves upon was only temporary. And for this reason we have remained the same as we were. And unrighteousness has remained. And the righteousness of God has disappeared from our eyes. And God himself has become to us dubious for in his place has stood the questionably figment OF OUR OWN THOUGHTS. WHAT HAPPENS WHEN THE TOWER CRUMBLES? There is a fundamentally different way to come into the relation with the righteousness of God. This other way is NOT by speech, nor reflection, nor reason, but by BEING STILL, by listening to and not silencing the conscience when we have hardly begun to hear its voice. When we let conscience speak to the end, it tells us not only that there is something else, a righteousness above unrighteousness, but also - and more important - that this something else for which we long and which we need is GOD. He is right and not we! He righteousness is eternal righteousness! This is difficult for us to hear. HIS WILL IS NOT A CORRECTED CONTINUATION OF OUR OWN. It approaches ours as WHOLLY OTHER. There is nothing for our will except a basic re-creation. Not a reformation, but a re-creation. For the will to which the conscience points is purity, goodness, truth and brotherhood as the perfect will of God. In its presence, the first need is for HUMILITY. We ought not to put our most fruitful moments to second-best uses in the belief that it is the way of piety and wisdom to pursue men's thoughts rather than God's. We ought to apply ourselves with all our strength to expect more from God, to let grow within us that which he will in fact cause to grow, to accept what indeed he constantly offers us, watching and praying that we may respond to his originating touch...to trust all in him. In the Bible this humility and this joy are called FAITH. Faith means seeking not noise but quiet, and letting God speak within--THE RIGHTEOUSNESS OF GOD, FOR THERE IS NO OTHER. WHAT HAPPENS WHEN THE RE-CREATION HAPPENS? In the place of despair, a child-like joyfulness will come: a joy that God is so much greater than we thought...Joy that from God much more is to be expected for our poor, perplexed and burdened life with our idealism, principles, and our Christianity, than we had dared hope! MORE TO BE EXPECTED! The old fetters are broken. The false idols begin to totter. FOR NOW SOMETHING REAL HAS HAPPENED--the only real thing that can happen: GOD HAS NOW TAKEN HIS OWN WORK IN HAND. The inner way, the way of SIMPLE FAITH is the way of Christ. He is the love of God, glorified---from him we received many different truths, but the simplest of them all we have least comprehended--that HE WAS THE SON OF GOD and that we, if we will, may go with him by simply believing that the FATHER'S WILL IS TRUTH and MUST BE DONE. One may object that this method is childlike and inadequate. I grant it. But this childlike and inadequate solution is the beginning of the vast plan of God. It remains to be seen whether the quaking of the tower of Babel which we are now experiencing will be violent enough to bring us nearer to the way of FAITH. We may take the new way. Sooner or later we shall. Note: This essay is one of Barth's earliest works and just one of many in Word of God and Word of Man. He acknowledges that many of his theological ideas move from the "foreground to the background and vice versa." He recommends reading the entire book as a whole to get the full picture. I'm on it Karl. Are you more of a listener than a reader? Lucky you. 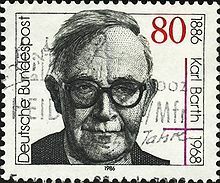 Go to the top of my blog and click on "Part One" of Karl Barth and you can listen to first half of this essay. The second half is there too. It's called "Part Two." (Fancy that.) If you can live with the dog collar jangles in the background and my occassional flub-up, you'll love it.